Rising default swap rates and falling stock prices are a misleading indicator of counterparty risk in the presence of contingent convertible or “CoCo” securities. For example, at DB, both have behaved alarmingly since mid-January (when JPM’s earnings report focused investor attention on energy risks in the banking sector) while measures of distress, such as senior debt prices and the Libor-OIS spread (Alan Greenspan’s “barometer of fears of bank insolvency”), have remained stable. The reason is DB has EUR4.6bn of additional Tier 1 (“AT1”) capital in the form of CoCo’s on top of its EUR44.1bn of core tier 1 (“CT1”) capital. The CoCo’s have an automatic equity-conversion feature if there is a capital-shortfall and can experience coupon-interruptions, particularly if there is an income-shortfall, so that the pricing of the securities (77c for one tranche on Thursday versus ~95 cents at year-end) reflect coupon and conversion, rather than insolvency, risk. CoCo conversion, of course, provides an additional layer of capital protection for senior debt holders and wholesale-funding counterparties hence the absence of distress-pricing in these markets. DB provides a case study for the regulatory value of CoCo’s in beginning to address moral hazard. DB’s capital plan calls for it to meet the 2018 minimum requirement by EUR1bn (0.25% of risk-weighted assets of ~EUR400bn); this buffer is below common practice and defies common sense in the context of DB’s after-tax legal charge of EUR5.2bn in 2015, on-going litigation risk, and the vulnerability of the capital plan to the price and timing of asset sales (including the deconsolidation of PostBank which is expected to account for one-third of planned risk-asset reduction of EUR110bn). Management’s decision not to raise capital under these circumstances simply reflects the asymmetry that shareholders garner substantially all the benefit if the gambit pays off but do not bear the full cost if it fails. The ability of regulators to intervene in this gaming of the system is limited because DB’s current CT1 ratio of 11.1% (11.7% if we pro-forma the sale of DB’s stake in China’s HuaXia bank expected to close in 2016Q2) meets the minimum 2016 requirement of 10.75%. The systemic risk, of course, is that in the event of the CFO’s scenario for needing capital “where markets more or less collapse or we get totally outsized litigation charges”, capital will not be practicably available. CoCo’s help to manage the systemic risk of these “surprises in life to the negative” by forcing an automatic raise of capital, through bailing-in holders in a conversion of debt to equity, if risk-leverage reaches a trigger-point (specifically, in the case of DB, if and for so long as the CET1 ratio falls below 5.125%). This adds an extra layer of capital at a time of financial stress when it might not otherwise be available, and so provides protection to deposit customers, senior debt holders, and counterparties in the wholesale funding market. In the case of DB, the hands of regulators are somewhat tied. With a core tier 1 (“CT1”) ratio of 11.1%, the bank is above the transitional minimum requirement for 2016 of 10.75% and has presented a plan to raise its ratio to 12.5% by 2018 thereby just meeting the forward minimum requirement of 12.25%. However, there is little margin of safety. DB’s CT1 ratio fell from 11.7% at the end of last year and improvement depends meaningfully on deals including sale of a stake in China’s Hua Xia bank (expected to close in 2016Q2 and lifting the CT1 ratio by ~60bps on a proforma basis) and deconsolidation of Postbank (generating, at EUR40bn, over one-third of planned reductions in risk-weighted assets). Furthermore, management acknowledges “litigation will remain a burden in 2016” and in 2015 booked after-tax charges of EUR5.2bn representing ~12% of year-end CT1 capital. There is no mystery around why management does not want to raise capital; with DB’s stock trading at 45% of tangible book value, it would be highly dilutive. CEO John Cryan avers that “absent the fully unexpected and material external event, we see no need to raise capital at this stage” while CFO Marcus Schenck adds the bank might need to raise equity “in a scenario where the markets more or less collapse or we get totally outsized litigation charges”. The problem, of course, is that these very circumstances would complicate a capital-raise and increase systemic risk. This is canonical moral hazard. Stockholders benefit disproportionately in the upside from management’s decision not to raise capital while third-parties share disproportionately in the downside. The post-crisis regulatory regime goes some way to address the asymmetry by raising minimum capital levels and ritualizing affirmations of resilience through the stress tests. However, it has an obvious drawback: the proximate cause of bank failure is not lack of capital but lack of liquidity which, in turn, arises from loss of confidence either among retail depositors (Northern Rock in September 2007) or wholesale funding counterparties (Lehman in September 2008). In a leveraged system there is no magic level of capital that can guarantee the confidence necessary for funding excess asset balances so that minimum regulatory requirements represent a societal choice around the trade-off between returns to bank stockholders (and hence the supply of bank services) on the one hand and systemic risk on the other. In seeking to clear these requirements by a whisker, despite the possibility of an outsized capital shortfall from litigation and deal-disappointment, DB is gaming the system. The notion that the bank will meet the 2018 requirement for capital by a mere EUR1bn (0.25% of risk-weighted assets of ~EUR400bn) after posting a 2015 after-tax litigation charge of EUR5.2bn and warning of on-going litigation risk defies common-sense even if technically consistent with the byzantine computation of regulatory risk-weights and false precision of operational risk add-ons. Fortunately, DB has issued liabilities (EUR3.5bn in May 2014 and USD1.5bn in November 2014) that help resolve the divergence between managerial and regulatory agendas. These take the form of contingent convertible or CoCo securities which have an automatic equity-conversion feature if risk leverage increases (and, specifically for DB, if and for so long as the CET1 ratio falls below 5.125%) without any action required of regulators. Furthermore, coupons can be restricted based on calculations of distributable amounts under both EU and, in the case of DB, German accounting rules although DB expects the “available distributable items” or ADI result from these calculations to be sufficient to make current coupon payments. Regardless, the coupon and conversion risk have caused DB’s CoCos to trade at a steep discount to par (Chart 1A) and contributed to a parabolic increase in the insurance premium demanded, through the credit default swap market, for protection against the possibility of default by DB on any of its debt obligations (Chart 1B). Furthermore, given that conversion would likely be dilutive, the CoCo’s have amplified negative returns on DB’s stock price, which has fallen 30% year-to-date. It is easy to conflate these price trends and conclude that conditions have deteriorated to the point where analysts are concerned not only with return on capital (as reflected in the falling stock price) but also return of capital (as reflected in falling bond prices) so that “the acute stress in stock markets is now making itself felt in bond markets”. However, the presence of CoCo’s in the capital stack complicates the interpretation of securities price movements. In particular, the falling stock price reflects the increasing fears of CoCo conversion in the short-run as well as assessment of the long-run prospects for the business. This conversion, of course, protects higher-in-the-stack claimants and DB’s counterparty status which is why the blow-out in CDS spreads is not accompanied by signs of increasing stress in DB’s senior debt prices or in industry-pricing, through the Libor-OIS spread (Chart 3), of systemic risk. In short, market prices reflect the fact that CoCo’s are working as regulators intended by raising the prospect of automatically bailing-in holders if capital buffers deteriorate and hence reducing the counterparty risk of DB and systemic risk in general. A key difference between the Libor and OIS rates is that the former assumes an initial exchange of principal (in the form of an unsecured, offshore deposit) while the latter does not: any net interest obligation arising from the difference between the fixed and floating legs of the swap is exchanged when the contract matures. As a result, the Libor rate incorporates a market assessment of default risk on principal while the OIS rate does not. The Libor-OIS spread therefore provides a measure of bank assessment of counterparty risk in the interbank funding market. It is for this reason that Alan Greenspan referred to it as a “barometer of fears of bank insolvency”. As noted above the Libor-OIS spread for a 3-month term is currently ~25bps and, while higher than the average level in 2015 of ~15bps, is not signaling distress despite the headlines around energy, around China, and around default swap spreads for European banks. 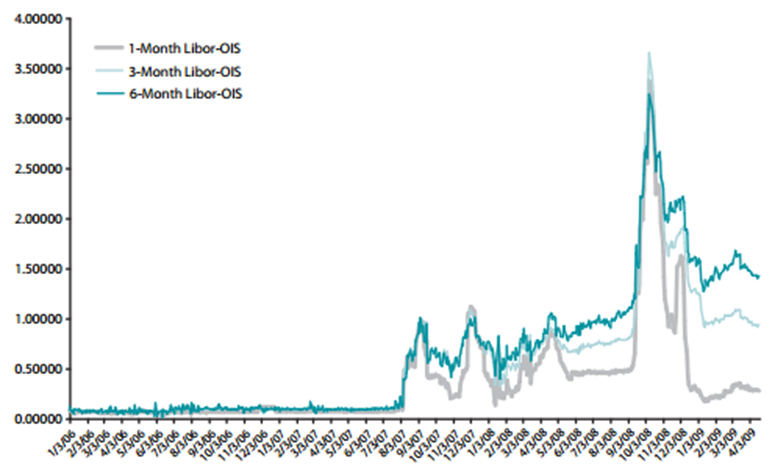 For context, the Libor-OIS spread increased to 1% in September 2007 as Northern Rock failed in the UK and over 3.5% in September 2008 as Lehman failed (Chart 4).